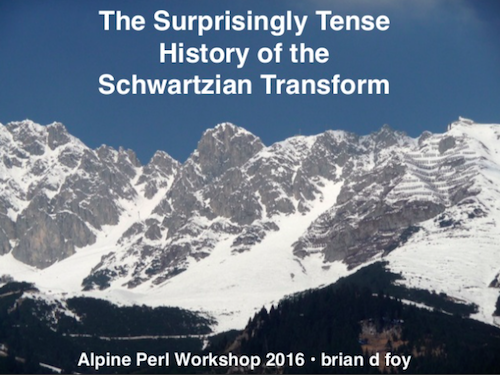 I was able to attend the Alpine Perl Workshop in Innsbruck thanks to the sponsors who funded my travel. Thanks to Booking.com, MyControl, perl Services, and Oetiker+Partner AG. I didn't talk about Perl 6 but I learned quite a bit. Liz put on a hands-on tutorial to upload a Perl 6 module. In that, I created Chemistry::Elements. That's the first Perl 5 module I published to CPAN. It's a simple and definable problem so it shouldn't be too much work to make the Perl 6 version. Zoffix's How to Make a Perl 6 Module and the examples in modules.perl6.org are quite helpful. Axel Beckert's talk on using Travis CI had Perl 6 examples, so that helped. Travis CI has it's own instructions for Perl 6. (Chemistry::Elements on Travis CI). The next day, I updated my presentation on Excellent Numbers where I explored a mathematical problem with Perl, then C, Julia, Lisp, and Python. Sawyer X related a story about a colleague who tried to reimplement Perl in Rust, and when he was asked "Why did you do that", he didn't have an answer. I don't think my Excellent Number work was practical or useful other than the fun of trying to solve what seemed like an impossible problem. Part of that work was sponsored by ServerCentral.